Aidan Smith: Is Ciftci worth £1.5m to Celtic? THESE are quiet times in the Dundee United shop, you would imagine. It’s the summer holidays and something of a close season just about remains – a brief interlude for the good mothers of Tayside when they hope to get their sons out of club colours and into nice cotton T-shirts. I checked the shop website yesterday to see whether United’s star man was modelling the 2015-16 strip but he wasn’t. I keyed in the player’s name but the message came back: “No products were found that matched your criteria.” Indeed, the only confirmed sighting of him was on the front of the calendar which also features the previous star man, Gary Mackay-Steven, and is the cheapest item in the store, discounted to £1. For United fans hoping that the shirt printer still has good reason to be spelling out C-I-F-T-C-I through August, September and beyond, none of this is a necessarily a bad sign. Obviously Nadir Ciftci declaring he is flattered by Celtic’s interest is not a good sign, but clubs hedging their bets and refraining from putting their main men on the merchandise is something with which we’re not unfamiliar. If players do end up leaving, then they can be photoshopped out of the traditional team line-ups, but it’s more embarrassing if they are filling the entire shop-window display looking mean, moody and – suddenly – gone. The first response to this saga is to say that it is just about the only show in town. That is, if you can’t get enough football, can’t take a break from it, don’t really care about Andy Murray and the golf at St Andrews, then you’ll be glad that Celtic want to buy Ciftci, that United don’t want to sell him, that the player is being simultaneously flattered and Holland-bound with his present employers for some pre-season friendlies. Therefore, he better be worth it. If Celtic succeed in acquiring his services, he better be a 20-goal striker at least. Equally, if United manage to fight off their advances, he better continue to be their leading performer, showing why the club were right to turn down big money for a final season of his frontline prowess in the hope he can help them go one better than the past two seasons and win a cup, before being allowed to leave – with grateful thanks – for nothing. Because Everton aren’t buying Ryan Jack or Rangers aren’t buying Scott Allan or Barcelona aren’t buying the scorer of the best goal I witnessed last season – Garry Wood’s senior status-saving wonder-strike for Montrose against Brora Rangers – there is extra focus on Ciftci, Ronny Deila, Jackie McNamara and Stephen Thompson, and extra pressure to make what they hope will be the right decision. Ciftci is a good player, a proven SPFL player, a striker of no little devilment, an annoying presence I’m sure if you’re a slow-turning centre-defender, a pest and a menace. The first time I saw him in the flesh he let Hibernian’s Paul Hanlon collect a throw-in and turn back towards his own goal. 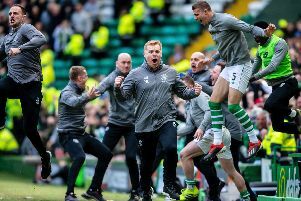 Ciftci was in pursuit, Hanlon knew this, but the United man let him have just enough room to encourage the belief he was in complete control of the situation. Then, before the Hibs fans could shout “He’s behind you!” – this was February and so panto-season was over – Ciftci had slunk alongside Hanlon, dispossessed him and stuck the ball in the net to set up an Arabs victory. Ciftci has quick feet, although you don’t have to be the quickest if your timing is excellent and this was all about choosing your moment. More significantly, the Turk would seem to have silent feet, enabling him to creep around and wait for his moment. He’s a sand-dancer, with footwork of which the old music-hall act Wilson, Keppel and Betty would be proud. Is this what Celtic need? Putting aside the fact that some of the faithful who witnessed Dukla Prague’s five goals in the weekend friendly would contend the defence is in more urgent need of attention before the Champions League qualifiers, there are others among them who might claim that Celtic don’t require their strikers to put in so much effort outside the box and what’s really needed is an out-and-out goalscorer to finish off all the chances they create. This is an old-fashioned, imperialist view which doesn’t fit with how Deila organises his team or why Stefan Johansen is his model footballer. Celtic haven’t had a Gary Hooper-type striker since Hooper left because they haven’t needed one. Leigh Griffiths is much more than a penalty-box striker; any Hibs fan would tell you that. So I’m sure Ciftci would be a success at Celtic. He wouldn’t be the star man any more and maybe he wouldn’t be an automatic starter every week, although I’m sure the higher wages would help to be compensation enough. Is he worth the £1.5 million United want for him? It’s going to be interesting – I didn’t say edge-of-the-seat exciting – to see if Deila is prepared to go as high as that, and if United continue to hold out for that sum. You’ve got to have sympathy for United’s fans, who have seen an awful lot of talent exit Tannadice in recent years. Their situation is similar to that of Hibs supporters when the team developed by Tony Mowbray was dismantled, although at least Scott Brown, Stephen Fletcher and Guillaume Beuzelin stayed long enough for the League Cup to be won. United fans will bemoan Deila’s lack of originality – shopping again so soon at the club where he bought Mackay-Steven and Stuart Armstrong. Some are still bemoaning their own club’s lack of ambition in selling that pair when United were in contention for silverware. They will see Thompson and McNamara keeping their prize asset as evidence that they still have some, and a snub to their predators. That would be a dramatic ending to this saga but I’m not sure it’s going to pan out that way. And with that soft-shoe shuffle of his, United may not even hear Ciftci leave.